Frederic Hand was born in Brooklyn, New York, in 1947 and is a graduate of the Mannes College of Music. Fred was a Fulbright Scholar to England and a student of Julian Bream. As a soloist he has toured North America and Europe, and has given master classes at the New England Conservatory, Yale University, and Dartmouth College, among others. He has been a guest artist with numerous orchestras and ensembles, including the New York Philharmonic, the Mostly Mozart Festival, and the Marlboro Music Festival. 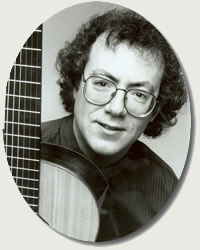 In 1986 Fred was appointed guitarist and lutenist with the Metropolitan Opera. He performed and arranged the theme from the Academy Award-winning film Kramer vs. Kramer, and his television scores include and Emmy Award for The Guiding Light. He is the director of the guitar program at the State University of New York at Purchase and also serves on the faculties of the Mannes College of Music and Bennington College. Fred lives in upstate New York with his wife, Lesley. This exciting lesson teaches the essential of good playing, such as posture, relaxation, fingernail shaping and the correct application of the free stroke and rest stroke. As you practice your arpeggios, scales, vibrato, trills and cross string trills, you'll learn to apply them to these pieces: "Lady Hunnsdon's Puffe" -John Dowland, "La Cavalleria de Napoles con Dos Clarines" -Gasper Sanz, "A Celtic Tale, Heartsong, Lesley's Song" -Frederic Hand. This lesson will improve the playing of all fingerstyle guitarists - beginning to advanced! In this DVD lesson, Frederic Hand teaches 7 beautiful classical pieces in detail, pointing out possible trouble spots and sharing important tips on technique and interpretation. He demonstrates ornamentation, slurs, rhythmic and melodic subtleties, timbral shadings, the importance of correct plucking strokes and other basics. Pieces include: "Vaghe Belleze, Bianco Fiore, Danza" -Italian Renaissance, "Sarabande" -Bach, "Study in B Minor" -Sor, "Adelita" -Tarrega, "Simple Gifts" -Shaker hymn arranged by Frederic Hand. Guitar virtuoso Frederic Hand teaches exquisite classical guitar arrangements of four widely known and much-beloved American Folk songs: "The Water is Wide, Wayfaring Stranger, Black is the Color of My True Love's Hair, We Are Climbing Jacob's Ladder". He shows you how - by using lush chords, rich harmonies and inventive improvisational elements - you can make each one a beautiful and compelling performance piece! Fred teaches full concert arrangements of each song as well as easier alternate versions for novice players who are just getting into this style of music. He then makes this a complete learning experience by carefully explaining chord extensions and substitutions, harmonic voicings up and down the neck of the guitar and elements of music theory. He also shows how to use improvisational techniques and ways to enhance these as well as other songs - so that you can make them truly your own. Eleven original compositions for the classical guitar composed in the eclectic style for which Frederic Hand has become well known. Written in standard notation only, some of these pieces allow for optional improvisatory sections (About Time and Missing Her). The composer performs all of the compositions on an accompanying recording. Some pieces require retuning the sixth string to low D. The level of difficulty ranges from easy to difficult, with the majority of the material falling at the intermediate level. Program notes are included for each piece. The online audio presents performances of all the pieces by the composer. Pieces include: "A Celtic Tale, A Dance For John Dowland, A Waltz For Maurice, About Time, Desert Sketch, Elegy For a King, For Lenny, Heart's Song, Lesley's Song, Missing Her, Simple Gifts". Frederic Hand Plays "A Celtic Tale"